Lovingly renovated cottage set in a quiet location, just minutes from Penryn town centre. The light living room leads to the kitchen and wet room on the ground floor with two bedrooms located on the first floor. An insulated and centrally heated summerhouse sits at the end of the beautifully landscaped garden. No onward chain. 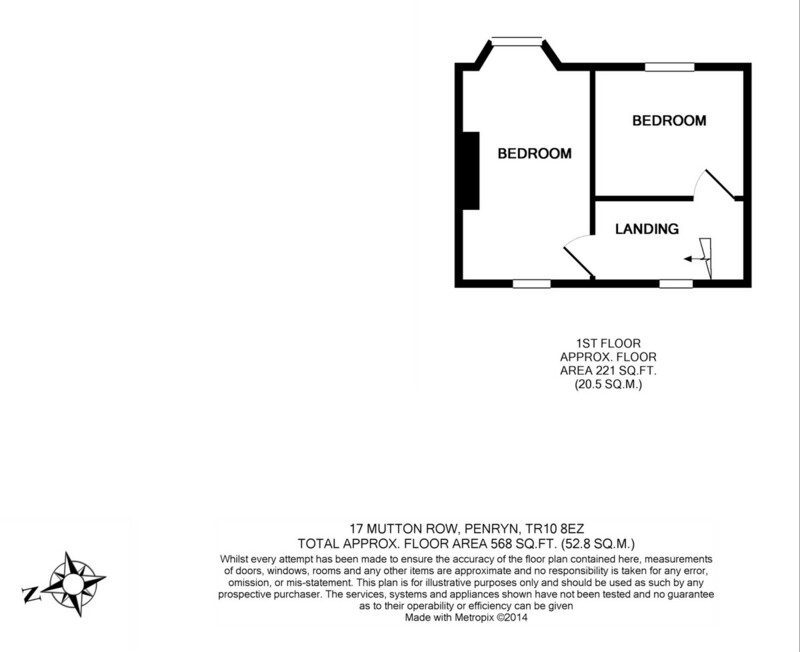 EPC = D LOCATION The property is situated a short walking distance from Penryn town centre. Mutton Row is part of a walk way stepping up from West Street leading onto Helston Road above. Many of these properties have been beautifully looked after and in the case of 17 Mutton Row the property has been extensively renovated throughout. PROPERTY Delightfully renovated characterful cottage with a light living room leading through to the Kitchen, wet room and WC with stairs leading up to the first floor and the two bedrooms, out is a lovely westerly facing landscaped garden providing access to the centrally heated and insulated summerhouse with toilet and wash hand basin facilities. Offered with no onward chain. Entering the property through the wooden door into an open porch area with electric meters and a partition wall which then opens to the living room. KITCHEN 8' 3" x 7' 5" (2.54m x 2.27m) An exceptionally bright room with two large glazed panels in the roof providing much of the light. The kitchen is fitted with a small kitchenette and wooden work surface inset sink and drainer. There are a few other hand made storage units. 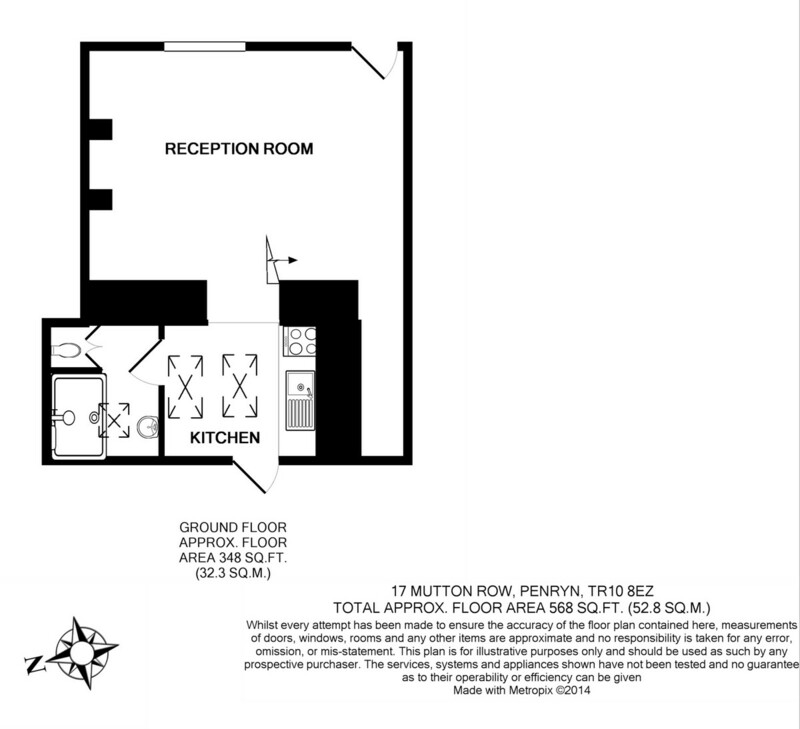 Space for a cooker, power points and telephone point. The kitchen leads in to a wet room, and out on to the garden. WET ROOM Beautiful stone tiled floor with thermostatically controlled shower, wall hung sink and mirror. The low level push button flush toilet is in a separate cubical. MASTER BEDROOM 13' 1" x 9' 3" (4.01m x 2.83m) Light dual aspect room with sash windows to the front and rear, is light and of a reasonable size with fitted dresser, power points and access to the loft. SECOND BEDROOM 7' 8" x 6' 11" (2.36m x 2.13m) Front aspect sash window, power points. OUTSIDE Leading out through the kitchen accessing a lovely patio area which then has a small step onto a gravelled ornate garden with shrub boarders. The whole garden has been beautifully landscaped and leads you to the summer house / office. SUMMER HOUSE 2.84m x 2.83m The main living area has a main window looking back at the cottage with a radiator beneath and glazed door to one side. This then leads through to an additional part of the summer house with a fitted toilet and wash hand basin. The whole summer house has been well insulated and comes complete with a working central heating radiator linked with the main property, so it could be used anytime of the year and for many different functions, office, teenagers space or occasional bedroom.